Aircraft Interiors Expo returned to Hamburg for three days of industry announcements, debates, discussion and networking between leaders within the interiors market. What was on everyone’s mind? How are IFE providers planning to meet the growing new aircraft supply? How is the aftermarket going to support all the scheduled upgrades? What will the impact be on the market of future demand? Key suppliers and stakeholders in the in-flight entertainment and connectivity market took to the CabinSpace Live stage Wednesday April 3, 2019. 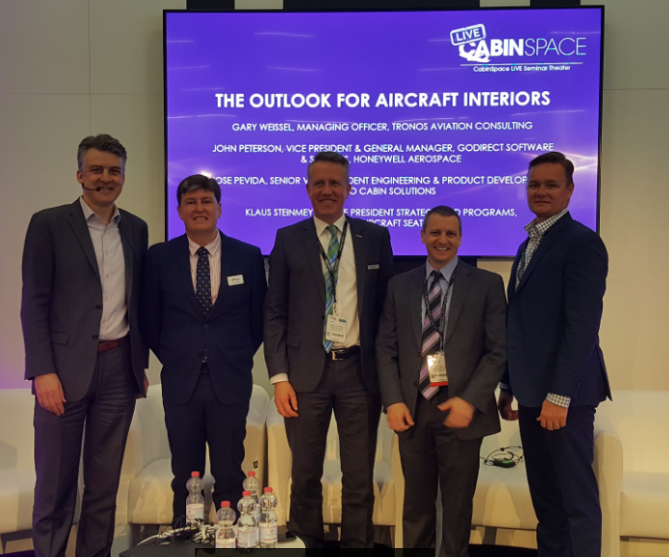 Cirium Aerospace Market Director Andrew Doyle moderated a panel discussing the future outlook for aircraft interiors. (L-R): Andrew Doye,Diretcor of Aerospace, Cirium,Jose Pevia, Senior Vice President Engineering & Product Development, Haeco Cabin solutions, Klaus Steinmeyer, VP Strategy and Programs, Recaro Aircraft Seating, Gary Weissel, Managing Officer, Tronos Aviation Consulting and John Peterson, VP & General Manager, GoDirect Software & Services, Honeywell Aerospace. The managing officer of Tronos Aviation, Gary Weissel gave an overview on the market outlook for the 70billion USD industry focusing on three key themes, supply chain stress, aftermarket modification trends and an interiors forecast for the next 10 years. As the production rates of wide body aircraft continue to grow it leads to a stress on the supply chain, as naturally these aircraft require more seats and IFE devices. In addition, the introduction of new aircraft programmes / platforms such as the A350-1000 and the upcoming 777X will continue to add to the requirement of further line fit work. Fleets Analyzer shows that 69 737-800s have already undergone the work for the interior to match that of the 737 Max 8s. 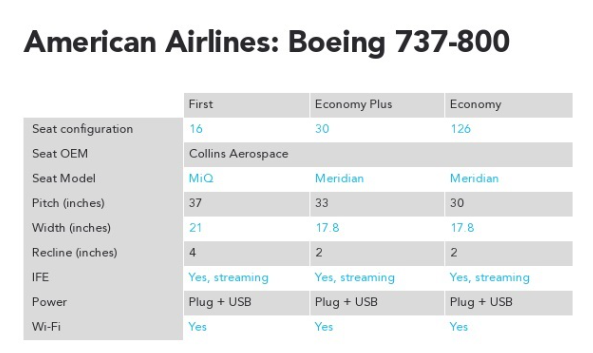 The most notable changes include a denser 172-seat layout with two additional rows of seats, in-seat power plus a new in-flight entertainment and connectivity system. In the interiors market forecast by Gary Weissel there was optimism for the future of the industry. It is predicted that over the next 10 years the industry will nearly double in size and be worth $136 billion. The three largest markets within this prediction are seats (36%), bins (12%) and IFEC (12%). These growth figures are not surprising for the interiors market as the latest Cirium Fleet Forecast shows that 46,460 aircraft, worth $3.1 trillion, are forecast to be delivered between 2018-2037 with 65% of these will be single-aisles.